Handy Art®, the source for glue needs. 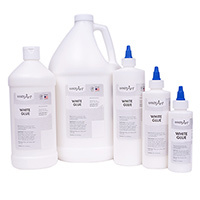 Handy Art® offers Washable and White Glue as well as Black Glue. 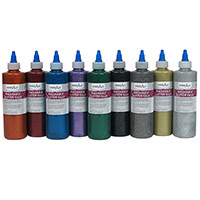 Handy Art® Glitter Glue adds color and sparkle to your art projects! Handy Art® Glues are certified AP non-toxic. Handy Art® Washable Glitter Glue combines glitter with glue for less mess while adding sparkle, shimmer and shine to all your art and craft projects! Use alone or as a decorative adhesive on cards, masks, wood crafts, scrapbooking, fabric, glass, felt and more. Handy Art® Washable Glitter Glue is certified AP non-toxic. Handy Art® Washable Glue washes from clothes and other materials when dry. Bonds to most porous materials and is ideal for projects that use paper, cardboard, wood and fabric. Handy Art® Washable Glue is certified AP non-toxic. 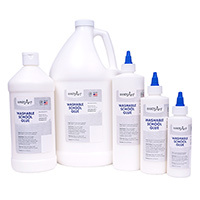 Handy Art® White Glue is an economical general purpose glue. Binds most all substrates; paper, wood, cardboard and tile. Washes up with soap and water when wet. Handy Art® White Glue is certified AP non-toxic. Handy Art® Black Glue can be used to create black outlines and as a contrast color on art and craft projects. Bonds to most porous and non-porous materials such as paper, fabric, wood and pottery. 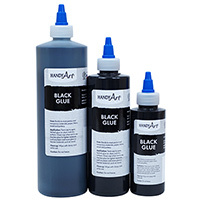 Handy Art® Black Glue is certified AP non-toxic.